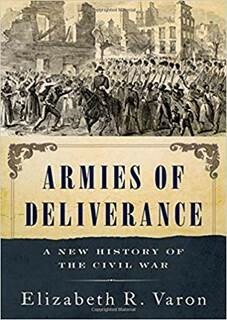 Please join us in congratulating Professor Elizabeth Varon on her recent publication: Armies of Deliverance: A New History of the Civil War (Oxford University Press). Professor of History and Law emeritus, Chuck McCurdy, delivered the fifth annual Salmon P. Chase Distinguished Lecture, sponsored by the Supreme Court Society and Georgetown Law, at the Supreme Court of the United States. His lecture was entitled “The Problem of General Constitutional Law: Thomas McIntyre Cooley, Constitutional Limitations, and the Supreme Court 1868-1878.” The lecture took place on November 30. History department student, Shira Lurie, published “Liberty Poles and the Fight for Popular Politics” in the Journal of the Early Republic (accessible here). Below is a recap of recent important department news. Professor Will Hitchcock's book The Age of Eisenhower (2018) was recently named one of the top twenty history books by Amazon's editorial board. Professor Fahad Bishara's book A Sea of Debt: Law and Economic Life in the Western Indian Ocean, 1780-1950 (2017) won the Peter Gonville Stein Award from the American Society for Legal History. This is the book's third award. Professor Cynthia Nicoletti's book Secession on Trial: The Treason Prosecution of Jefferson Davis (2017) won the Cromwell Book Prize from the American Society for Legal History. Professor David Singerman won the inaugural 1500 Penn Prize of the Treasury Historical Association (THA) for his paper, "Science, Commodities, and Corruption in the Gilded Age." For more information, please see THA. Tom Butcher (recent PhD and current lecturer for the History Department) has published a piece in The Washington Post. The piece, titled "The bad science behind the Trump administration’s anti-trans policy," can be read in full here. Spring 2019 course descriptions are now available. You can download the PDF here. Tutorial descriptions are also available for download here. Current tutorial offerings are listed on SIS/Lou's List. Philip Zelikow was recently named an Advisory Board member of the new Sine Institute of Policy and Politics at American University. You can read the full story here. The History Department's own Professor Kevin Gaines has been featured in a piece for UVA Today. You can read the full piece here! UVA Today published a piece about Claudrena Harold and Louis Nelson's new book, Charlottesville 2017: The Legacy of Race and Inequality. You can read the piece online here, and you can find out more information on the book here. Prof. John Mason participated in an interview for the Washington Post along with Vogue's Creative Director, Andre Leon Tally, discussing how it took the magazine 125 years to feature a cover photo shot by an African American photographer. Prof. Waitman Beorn contributed this op-ed to the Washington Post about the toppling of "Silent Sam" at UNC. President Trump's decision to pull the U.S. out of the Iran nuclear deal is raising questions about what comes next. Prof. Brian Balogh and his BackStory co-host Ed Ayers were recently interviewed about this subject on NPR's Here and Now. They say say the past may shed some light on the answer: Americans have long broken international promises, including their agreement to live peacefully as a British colony in the 1700s and, two centuries later, to join the League of Nations. Congratulations to Prof. Fahad Bishara, who has won the J. Willard Hurst Prize for best book in socio-legal history by the Law and Society Association for his book, A Sea of Debt: Law and Economic Life in the Western Indian Ocean, 1780-1950 (Cambridge University Press, 2017)! Congratulations to grad student Erik Erlandson, whose article, “A Technocratic Free Market: How the Courts Paved the Way for Administered Deregulation in the American Financial Sector, 1977-1988,” has been selected to receive the 2018 Ellis Hawley Prize for the best article published in the Journal of Policy History in 2016-2017! You can read more about the prize here. Congrats to grad student Chris Halsted, who has won a Gerda Henkel Stiftung Scholarship for 2018-2019 to support his research on 10th-century Slavic state formation! You can find out more about the Gerda Henkel Stiftung here. Congratulations to history grad students Monica Blair, Brian Neumann, and Abeer Saha, who have won 2018 Jefferson Scholars Foundation GSAS Fellowships! Funding from this fellowship will enable them to spend more time concentrating on their dissertation research. In related news, grad student Justin McBrien has won a 2018 JSF National Fellowship, which will give him support for his final year of dissertation writing. Congrats everyone! You can check out more about the Jefferson Scholars Foundation here. Congratulations to Profs. Risa Goluboff and Joe Miller, who have been elected to the prestigious American Academy of Arts and Sciences! With Mark Zuckerberg's congressional testimony and the recent FBI seizure of Michael Cohen's legal record, concerns about privacy of information have been making a lot of headlines recently. To provide a historical perspective, Brian Balogh recently spoke (along with his BackStory co-host Nathan Connolly) on NPR's Here and Now about the long history of American privacy and infringement, stretching back to Colonial-era search and seizure and the early origins of the National Security Agency. Congratulations to L. Kent Merritt, the history department's administrative supervisor, who has won the University of Virginia Alumni Association's 2018 Distinguished Service Award! Congratulations to history grad students Jonathan Cohen and Joey Thompson, who have won 2018-2019 Mellon / ALCS dissertation completion fellowships! These fellowships are granted annually to students in all disciplines, making them extremely competitive. You can read more about the fellowship here. Congratulations to Justin McBrien, who has been awarded the 2018 Frank Finger Graduate Fellowship for Teaching. Funded by a gift from J. Huston McCollough, II in honor of Frank Finger, Professor Emeritus of Psychology, this Fellowship is awarded annually to a teaching assistant in the College of Arts & Sciences, in recognition of stimulating and organized classroom teaching or lab instruction.